Across the Greater Mekong Subregion, there are over 500 special economic zones (SEZs) and industrial zones located near economic corridors in the subregion and covering over 50 million people. 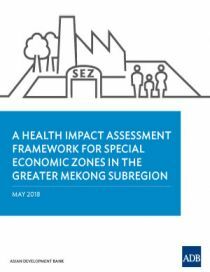 This proposed health impact assessment (HIA) framework recognizes these SEZs and economic corridors as economic engines of the subregion and aims to maximize benefits for all. The framework aims to provide enhanced guidance for identifying, mitigating, and managing health risks and impacts of unprecedented industrial and economic development in these SEZs, and seeks to address transboundary health issues associated with mobile and migrant worker populations. It proposes HIA as an effective SEZ management support tool to achieve optimum benefits for businesses and associated communities alike.